Yesterday, after several abortive attempts, I finally managed to drag Him Indoors to Derry Watkins’ Special Plants Nursery at Cold Ashton, near my home town of Bath. Although Derry’s nursery is tucked half way down a steep hill below the village it’s evident that the settlement was aptly named. The view out towards the Severn Estuary and Wales is beautiful, but it’s a chilly spot. At the end of Greenways Lane – one of those byways that has a strip of grass in the middle and golden dandelions at the edges – we arrived to find we were the only customers. The nursery team had found a warm, sheltered spot for an alfresco lunch. I felt slightly guilty intruding on their break but, as I hoped, there were many wonderful plants to distract us. 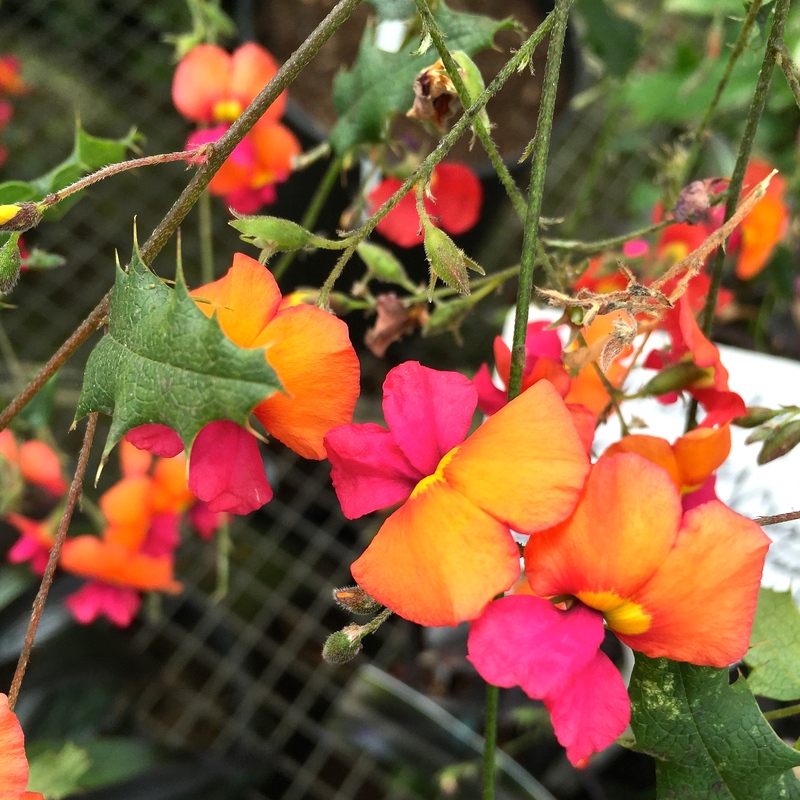 Special Plants Nursery had already lived up to expectations, but then, as I cast a discerning eye over one last bench, I spotted Chorizema ilicifolium commonly known as the holly flame pea. I was smitten, but alas only the display plant remained. Thankfully this lanky Western Australian native with its holly-like leaves and neon blooms is easily raised from seed, flowering when only a few inches high and continuing on to about 3ft at maturity. The plants require the shelter of a cool greenhouse or conservatory but reward with copious flowers from March until October. Seeds of Chorizema ilicifolium are available from Chiltern Seeds. As soon as there is any space available on my windowsill I’ll be sowing some! Love the brilliant sunset colors; I’ve added this to my “To Order From Chiltern” list! How wonderful to visit the nursery. I am trying some interesting seeds from Derry’s catalogue. Ooooh! Which ones? Do tell….. I am trying Althaea cannabina, Ageratum corybosum, Eryngium ‘Physic Purple’ and Persicaria orientalis amongst others. A bit of a purple phase I see now. Nice choices. Admired the persicaria at Great Dixter last summer. If only I had enough space! Good luck propagating your wallet – what fantastic images this conjures up! If only 🙂 I spend about as fast as Jack’s beanstalk grew! OH, WOW! Those are beautiful!!! I’m going to have to check that plant out! Thanks for sharing! You are welcome! Hope you manage to track it down. thanks for sharing your trip to Special Plants. I enjoyed her monthly column last year in Gardens Illustated and reading about all the rarities she carries. I would love to go. Someday. Yes, that column was brilliant. Derry has an eye for a good plant. It’s a little off the beaten track, but worth the diversion. A long way for you though! I will be! It’s a bit on the tiny side right now so am going to mollycoddle it inside until it puts out some suitable shoots. One of those will have your name on it Gill! I have bought a lot of seed from Derry over the years, but never been to her nursery, so very envious. She is a trenchant observer of plants and I like her descriptions and approach. On my bottomless list, though..
Derry Watkins has such gorgeous plants. I have a Geranium maderense ‘alba’ which I have planted in the bed in my greenhouse, I daren’ t risk it outside. I can’ t wait for it to flower. All those Impatiens sound interesting. Oh to have a greenhouse! Mine must take their chances outside but it can be dicey. This last mild winter was a godsend and has allowed everything to keep going, requiring a lot of hacking back. I have now planted lots more maderense out, which is surely tempting fate!